Have you ever heard about Dieng plateau? Yes? No? Dieng plateau is more commonly known as Dieng plateau Wonosobo, though the plateau is located in Banjarnegara and Wonosobo regency, Central Java. The plateau offers a mixture of nature, heritage and tourism sites. There are some beautiful lakes, hills, breathtaking scenery, as well as refreshing tea and coffee plantations. Plus, being high up it’s very cool and refreshing. To help you arrange your trip to Dieng I’ve created this guide. It covers everything from how to get from Yogyakarta to Dieng, what to see when you are in Dieng and where to stay. You can use the links below to jump to the relevant part of this Dieng guide. Dieng is a three-hour drive away from Yogyakarta in the highlands of Java. It’s an isolated place far enough away from the tourist trail that you don’t get the usual crowds. Yet there are a lot of fun things to do in Dieng.I’ll share some of my favourite spots in Dieng that you should visit whenever you get the chance. Please be advised that this list is not in any particular order. Though some people say that this place is overrated, I still think Telaga Warna and Telaga Pengilon area is a great place to explore. It is also very beautiful. In fact most people who come to Dieng do so just to visit this complex (Telaga Warna and Telaga Pengilon). They don’t walk around the area and never find out about the other attractions. Telaga Warna, a lake is incredibly colorful with shades of red, green, blue, white, and violet, while Telaga Pengilon, pretty much a normal color with clear waters. The unique thing is the waters don’t mix. Besides enjoying the two lakes, you can also visit the Gua Sumur cave. The cave is actually inside the complex of Telaga Warna and Telaga Pengilon lakes. There are two places where you can enjoy the view of the lakes from above. One is from Sidengkeng hill Petak 9 Dieng and the other one is from Batu Pandang Dieng. Check out the two photos below to see the difference. Kawah or is crater in English. Though I’ve been twice to Dieng, but I never really got to see the crater (yeah shame on me). Some of my friends say that it worth seeing though. Besides the Sikidang crater there are several other craters spread around Dieng. This temple complex is not as huge as Borobudur nor as magnificent as Prambanan, but for sure Arjuna temple complex is older than them both. Arjuna temple complex in Dieng was built in the 7th century. If you would like to enjoy the temple complex by yourself, better come early in the morning. So much fun! If you have enough time, you can also explore the tea plantations or even the coffee plantations. Not only can you pass through the plantations, but you can also go in and explore the field. In the Tambi tea plantation, you can join the Agrowisata tour. There will be a guide that will accompany you and explain several tea related facts to you. Afterwards, you can go to the tea factory and learn about the process for making tea leaves into the tea that you can drink. I would like to add one more places, which is Bukit Sikunir (Sikunir hill) – You can find out about it in this article I wrote. Watching sunrise from Sikunir Hill really is quite amazing. There are a lot of local delicacies that you can try when you visit Dieng. Some of the things I recommend you try include Tempe kemul, Carica and Mie Ongklok. Let me tell you a little bit about them so you can decide if you want to try them for yourself. Let’s get started. – Tempe Kemul. Tempe (or tempeh) is fermented soya beans, which is fried (but not until crispy) with flour. I like to eat Tempe Kemul with green chilies. It’s spicy and tasty. 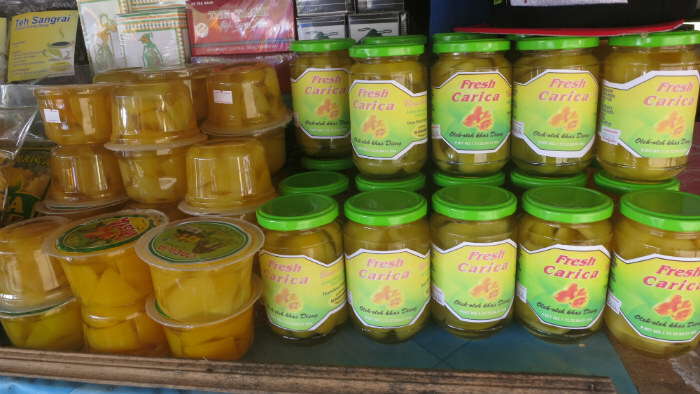 – Carica is a kind of fruit that (a lot of people say) can only able to found around the Dieng plateau area. Carica is a mini papaya. It taste good fresh or blended as a drink. 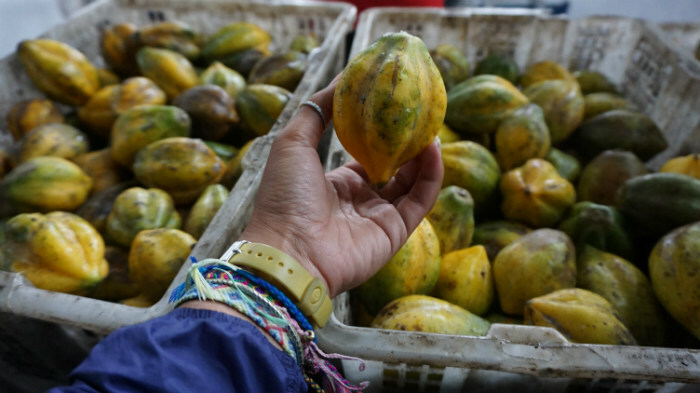 Carica is not as sweet as papaya. – Mie Ongklok is a noodle dish that is famous in Dieng. I am not a big fan of Mie Ongklok. I think it is too sweet, but you should give a try! A lot of people like it. If you visit Dieng I recommend trying all of the different dishes. Tempe Kemul is a nice snack to eat with a meal and Carica makes for a really nice, though very sweet, desert. There are not very many hotels to choose from in Dieng. Those that exist are mostly very basic and overpriced when compared to what is available in Yogyakarta. I would not recommend staying in Dieng. I think it’s more convenient to stay in Yogyakarta. However, if you choose to do so there are two areas where you can stay, Banjarnegara and Wonosobo. Easy! You can either reach Dieng from Semarang or Jogjakarta. I’ve been from both placess and if I am not wrong it takes approximately 3,5 hours-ish from either city. I wouldn’t advise this since there is no direct bus (as far as I know) from Jogjakarta to Dieng. I read some articles that said you should change bus 3-4 times to be able to get to Dieng. The journey can take 5 hours or even 7 hours. Taking a bus is a good option if you travel solo, would like to go cheap and you can’t drive a motorbike. From Yogya you need to go to Magelang and continue to Temanggung and last to Wonosobo (Dieng plateau area). This is actually a great option IF you can speak a bit of Indonesian – go check my Indonesian language section about direction here. Renting a motorbike in Yogya is cheap. Make your phone works (buy an Indonesian sim-card, it is so cheap) so you can access Google maps and drive there. Get a good motorbike since you’ll drive uphill quite a lot during the journey. Along the way, especially when you are about to reach Dieng, you’ll get some great scenery of tea and coffee plantations. This is really nice. Driving along the main highway though, which you do before you reach Dieng, is not a lot of fun because there are a lot of trucks on the road. If you have the budget, do not hesitate to just rent a car with a driver. A car rental will include gasoline and an English-speaking driver. You can hire a car from Yogya for the day trip to Dieng (from Jogja). Visiting Dieng is a fun day trip. The scenery along the way to Dieng is really special and there are a lot of things you can do when you finally arrive. I’ve partnered with independent drivers and a local travel agency to offer Discover Your Indonesia readers a special day of fun and excitement. Want to make a day trip to Dieng? Press the button below to find out more about the tour. Have you ever visited Dieng? What was your favourite place to visit? PS: Curious about the dreadlocks kid and the procession? Why not go to Dieng Culture Festival. It’s normally held at the beginning of August. Beautiful view from telaga warna :D. Visit my blog Solo trip 20 days to flores. Thanks for visiting my blog and yes it is! Dieng is pretty! Can you please advise, should i stay in Yogyakarta or stay in Wonosobo when I am visiting Dieng? Depends what do you want to see/explore. Is 3 hours enough for you to explore Dieng? If yes, then better stay in Yogyakarta. I got there by bus from Magelang and it was pretty easy. Would be the same from Yogya. Catch a bus to Wonosobo and then a bus from there to Dieng. Really straightforward and takes 5 hours. wah.. tentang dieng ditulis dengan indah pake bahasa inggris hehe. Salam kenal Mas Edy. 🙂 Iya, dan semoga sampah di Dieng bisa segera diberesin supaya Dieng tetap terjaga keindahannya. Hi Firsta, we are gonna be checking in Jogja (excitedly!) end of Oct for a 4d trip. Just curious to know if its advisable to have an itinerary that takes us from Jogja to Borobudur then Dieng Plateau and back to Jogja again? Thanks alot! Sure it is possible. People usually start early, like 4 am from Jogjakarta and stay in Borobudur for the sunrise until around 8-8:30 am and then go to Dieng. Probably back again to Jogjakarta around 6 pm. thanks for the tips. I am planning to go to the Dieng Plateau in September. Thinking to bus to Magelang and was hoping that there is a bus to the plateau but can’t find any info other than renting a driver. I had thought to stay at least 1 night there but I wonder whether it’s cheaper to book the driver for a 1 day re-turn trip rather than 2 individual ones. Would you have any idea of costs? I’ll get back to you through email. I am planning to stay in Magelang for 2 or 3 nights so to do a 1 day trip to the Dieng Plateau, and also a trip to both the Prambanan and Borobodur temple. As they are in different directions, I am thinking to visit each on a separate day. Or do you think it’s possible to do them on 1 day? Anything else worth seeing in or around Magelang? I don’t have any recommendation for place to stay in Dieng. Below are places in Wonosobo. Kresna Hotel or Surya Asia Hotel or Duta Homestay is pretty ok. Please keep in mind that accommodations around Dieng (and Wonosobo) are mostly basic. Hi Cinzia. Thanks for your kind feedback. Unfortunately I don’t have the contact details for any Italian speaking guides operating around Dieng. I’ve visited the Dieng and I enter the forbidden caves in Telaga Warna, Semar and Sumur Cave. The caves can’t be entered by public for spiritual reasons. I paid for a jurukunci/keymaster service to take me in. The cave was actually quite interesting for someone who never been in a hole like that. The reason I wanted to enter the cave with the keymaster, because I was expecting to see something supernatural… but.. well.. nothing happened :D.